Send or schedule bulk WhatsApp messages via your browser. Use on Windows, MAC or LINUX! 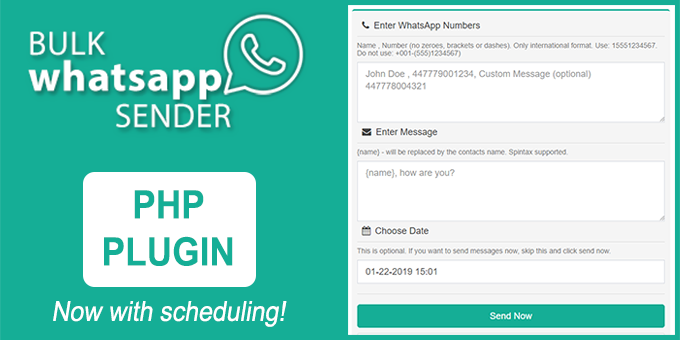 This is a PHP application based on Whatsapp Web, it allows sending or scheduling bulk WhatsApp messages and campaign to unlimited numbers, all that you have to do to is paste in your contacts, enter the message, choose your date and schedule or click send. Your supported browser will open WhatsApp web and your campaign will start. Now sit back and relax while the tool does the hard work of sending multiple messages. An ultimate WhatsApp Messaging solution with a wide collection of option and services gives you more flexibility when sending your campaigns. These solutions allow you to send or schedule WhatsApp Campaigns in a very simple way, convert numbers into proper WhatsApp format, adds name shortcodes to personalize messages, skip accounts not on WhatsApp and view message reports. You can integrate this PHP script into your own current CMS platform or add a login system and generate secure passwords to provide paid access to clients. In addition, Bulk WhatsApp Sender PHP plugin provides an anti-blocking and invalid-number skipping technique which reduces the chance of getting banned and keeps WhatsApp account safe. Its a turn key scalable solution provided with full source code which gives you the freedom during customization. Buyers will get a bonus tool: WhatsApp contact cleaner for free. The plugin is very simple yet very useful and allow you to send or schedule to WhatsApp over the web without installing any desktop software. So if your at work, abroad or not using your own computer and have Windows, MAC or Linux, you can access it from anywhere with a browser.